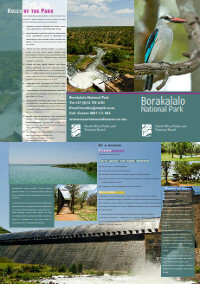 Borakalalo is situated 60 km north of Brits. It consists of 13 000 ha of woodland and open bushveld – in a remote and peaceful area of unusual beauty and diversity set in Kalahari veld and woodland country, along the banks of the Moretele River and the 800 ha Klipvoor Dam. 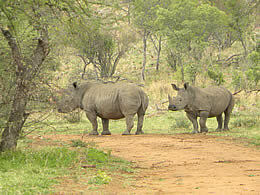 An extensive network of roads through the reserve are accessible for all vehicles and there are a number of attractive picnic and braai sites for the use of day visitors. Generally mild to hot.The Moretele River, which runs into the 800 ha Klipvoor Dam in the park, also has a beautiful stretch of Riverine forest. The park is a very popular fishing spot. 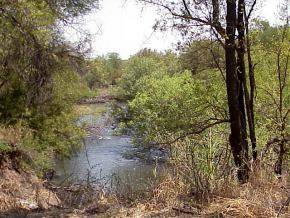 This is one of the most accessible reserves to the Johannesburg and Pretoria areas which makes for an excellent and unusual day or weekend excursion. Angling on both the Klipvoor Dam and the Moretele River is permitted and is regarded as being amongst the finest in the country. Carp, bream and barbel are the principal fish species although yellowfish do occur, offering excellent sport when taken on light tackle. An abundance of wildlife and more than 350 bird species can be viewed. The reserve which is some 13 000 ha in size conserves a wide variety of antelope, giraffe, white rhino, leopard and numerous smaller mammal species. Birdlife is particularly abundant with over 350 species recorded, including 11 eagle and 18smaller raptors. 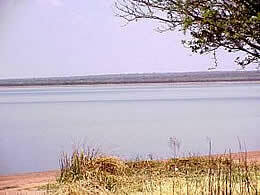 The reserve offers excellent camping facilities. 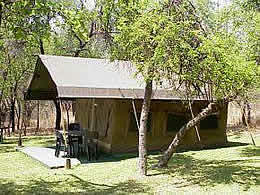 Accommodation is on a self-catering basis in two tented camps and a camping site. It is essential to book for both Moretele and Phudufudu Camps at all times, and for Pitjane campsite over long weekends.